When two creatures known as “MUTOs” (Massive Unidentified Terrestrial Organisms) awaken and threaten our existence, the huge beast Godzilla must restore balance as humanity is left defenseless. The movies stars Aaron Taylor-Johnson as Lieutenant Ford Brody, Ken Watanabe and Sally Hawkins as two scientists, Elizabeth Olsen as Ford’s wife, and Bryan Cranston as Joe, a scientist who is Ford’s dad. This movie is filled with action, destruction, and awesome monster fight scenes. Aaron Taylor-Johnson and Bryan Cranston both did a great job acting, and Bryan Cranston did have a few emotional scenes. The visual effects and the soundtrack are both great. The most exciting parts are the first hour and the last half-hour, which is the boss fight between Godzilla and the MUTOs. The half-hour between those two parts isn’t as interesting, but once Ken Watanabe says, “Let them fight,” everything starts to warm up again. 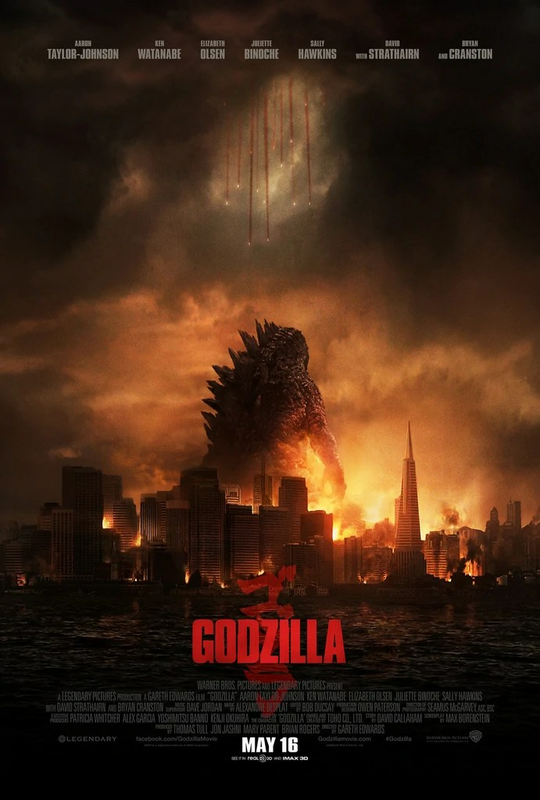 Godzilla feels very similar to last year’s blockbuster Pacific Rim, with all the monster battles and city destruction (especially San Francisco), but Godzilla feels more realistic and exciting, and the scenes before Godzilla first arrives on screen are still interesting. The best scene of the entire movie is when Ford and a couple other soldiers enter skydive into the city, just as the final battle between the monsters begins. The director, Gareth Edwards, clearly knows how to make a great movie (this is his first blockbuster movie, his other movie was the low-budget Monsters) and I hope he makes a lot of great movies in the future (including a Star Wars spin-off that he is set to direct). The movie is very well-done, including the cinematography, visual effects, and casting, and it’s very exciting. I think anybody 12 or over would love this movie and will have a great time watching it. This entry was posted in Action, Movies, Science Fiction and tagged aaron taylor-johnson, bryan cranston, films, godzilla, kaiju, ken watanabe, monsters, movies, muto, recommendations, reviews. Bookmark the permalink. Your review is very well written and I could tell that you really enjoyed the movie. To me it seems too scary. Even though I realize all along that this is just a movie, I still get scared by horror scenes and coping with some long sleepless nights. I am very much looking forward to seeing you in Israel end of this month.